Seeing is Believing This sample manual to teach Computer Fundamentals is in MS Word format. Does your company use computers? Of course it does! But, does your staff know how to use them? Do they know how to efficiently use today’s most popular programs? Save time and money. Give them the gift of efficiency. When browsing the internet, making word documents and browsing through windows explorer, people who have been using computers for a while may over-look the fact that not all people know how to use computers. Even if it’s just browsing for a file in “My Documents”, some people just do not know the ways of the computer world. Our customizable courseware is your solution. 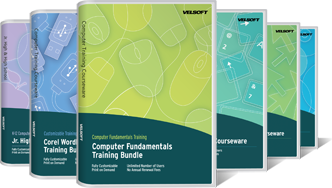 This courseware bundle includes everything you need to start teach your colleagues, participants and students how to use their computers and the popular programs that are commonly used today. From basic to advanced and expert levels of computer use, you will have the power of knowledge at your finger-tips! If you have not already purchased with us in the past, we invite you to Download a free sample, because seeing is believing.